The man sat holding his two young children in the middle of an Afghan battlefield littered with landmines and bones. When he spoke, his voice was cracked like an empty clay pot crumbling in the desert sun. He told the journalist that he had lost three of his five children in just two weeks to the landmines and starvation. Their small village had been consumed by famine and drought. A little farther South, in the town of Bamiyan, the Taliban controlled every move of the Hazara people. Women smothered in swaths of cloth held their children close, as the white noise of gunfire echoed in the distance. I tore my eyes away from the television screen. The deep irony struck me: Here I was, after school, sitting comfortably in my home having lunch, watching people who had not eaten in days and children who could not go to school. Watching documentaries on television was where I first learnt about the suffering of the Hazara people, a minority group that lives in Bamiyan, and other places in the world like Pakistan. I became curious about Bamiyan, and wanted to learn more. I learnt that girls were not allowed to go to school. If they did, they and their families would be severely punished. Yet, many girls hungered for a proper education. They felt disempowered and invisible. Education was the key to freedom, to building a better life for their families. I started learning about other societies facing similar struggles. Eventually, I came across Malala Yousafzai’s Nobel Peace Prize speech. She spoke of changing the world through education. Her belief in the power of education was so passionate and absolute. I learnt that she was just 15 years old when she was shot on a bus by the Taliban after taking an exam. In Singapore, children dreaded exams. Yet here was a teenager in Pakistan, risking her life to take an exam, only to get shot on the way home. This confused me. Malala was right. Education would indeed give people more opportunities — help them get qualifications and a job. We had this in Singapore for everyone. But were we happy? Did we feel empowered to change the world? If not, why not? Why is education viewed so differently by parents and children in Singapore? These were questions I wanted to explore. I also wanted to learn more about these girls who yearned to learn, but were restrained from doing so. Girls who suffered from discrimination and were robbed of opportunities at birth. Girls who wanted to go to school despite starvation and terror. 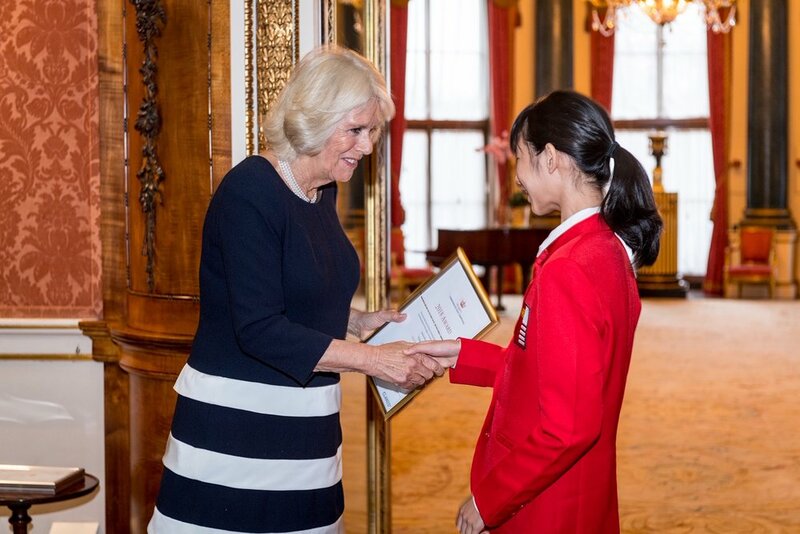 When I decided to participate in The Queen’s Commonwealth Essay Writing Competition, I started by writing a series of letters between a girl from Singapore and a girl from Afghanistan. In the letters, I completely fleshed out the characters. I knew who their families were, their siblings and even their pets. Amana had a pet goat whom she eventually had to sell because a landmine had blown up the rest of their family’s livestock, plunging them into poverty. Yu Zhen frequently got into disagreements with her mother, who was very invested in her grades, flying into rages when she didn’t do well. Each character had her own personality too, with Amana being mature and resilient, and Yu Zhen naïve and lost. Through the letters, I got to know the two girls as my friends. Neither of them was perfect; they had their own problems and their own flaws. When I started writing the letters, I could only see the vast differences between the girls. But the more I wrote, the more I realised that what they needed was the same. When I was almost done with the letters, and about to submit my work for the competition, disaster struck! Alas, the word limit for the junior category was 750 words, and I had written over 2,800 words. How I did not notice the word limit remains a mystery to me to this day. Amidst my panic, one good idea came. I realised the best way to condense the essence of the letters was to write a poem. Poetry would work in my favour given the tight word limit because poetry can convey meaning not only through words but also through form. 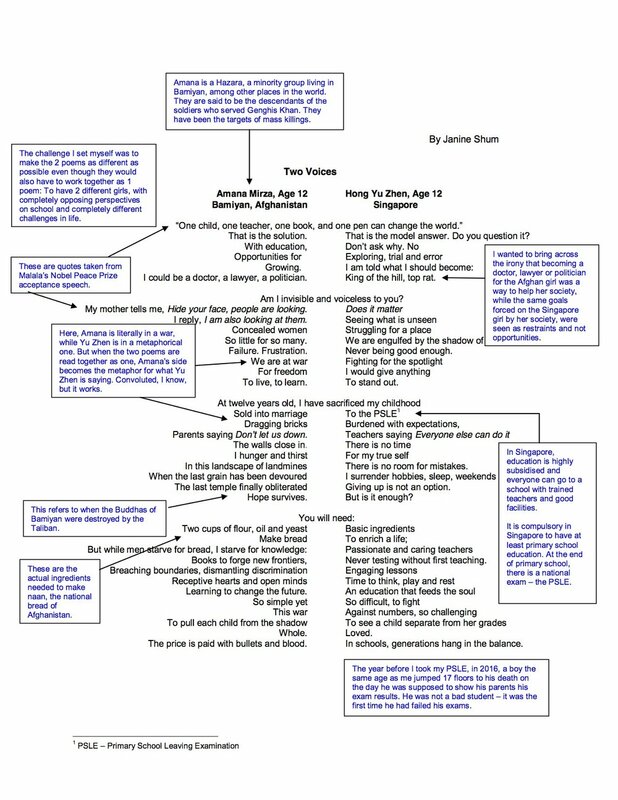 I chose the “twin cinema” poetic form because its structure reflects my message. The twin cinema form consists of two columns of individual poems. Just like the two columns, the two girls are worlds apart. Literally. Amana faces death almost every day. She witnesses starvation, horrible suffering, loss. In my head, she has to carry excruciatingly heavy buckets of water from the well for her family, making her way across a land littered with landmines. One wrong step and she would be gone forever. She hungers for education. It is her obsession. She sees it as an opportunity for freedom, an opportunity to improve lives. In contrast, Yu Zhen has that education. She has a proper school, many qualified teachers, too many assessment books.... But she is drowning. Not physically, but emotionally. She tries her best to do well, she sacrifices all her rest to study more in an attempt to be valued, but she sacrifices in vain. She is always in the shadow of those who do better than her. Her teachers and her schoolmates judge her based on her exam grades. She is always “average” or “the girl who got 73,” and she hungers to be appreciated as a whole person, beyond her grades. Yet, what the two girls really need is the same — an education designed to empower and motivate. In the poetic form, this is represented by the fact that the two columns can be read together, as a single poem: One desire, one hope. The twin cinema form was pioneered in Singapore by poets Yeow Kai Chai and David Wong. It may have been developed earlier elsewhere, but I have them and other Singapore poets to thank for using it and inspiring me. After I had won the junior prize for the competition, I was asked what I wanted to do next. I decided that, like Malala, I wanted to wanted to learn more and write about issues that might benefit from another voice asking for change. Change is not one big thing that suddenly happens because some high official decides to do it. Change is something that everyone can do, even in the simplest of ways. It is made out of many small people making small differences that eventually change the world. 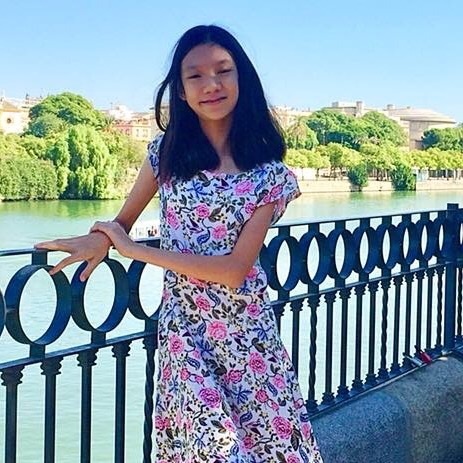 13-year-old Janine Shum is the junior winner of The Queen’s Commonwealth Essay Writing Competition 2018. 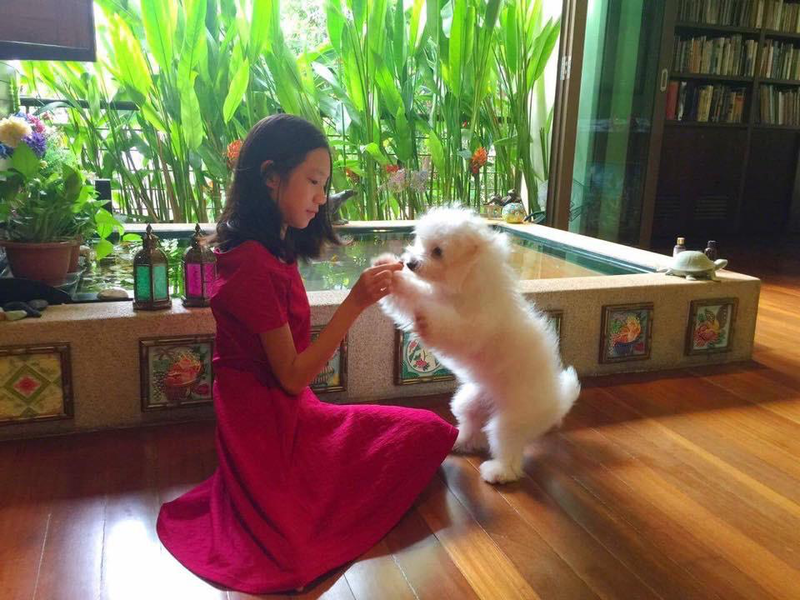 She resides in Singapore, where she studies in National Junior College. In her spare time, Janine enjoys creating funny little animations of ill-fated characters in unfortunate situations.